The ruling Communist Party has formally elevated Xi Jinping's status to China's most powerful ruler in decades, setting the stage for the authoritarian leader to tighten his grip over the country while pursuing an increasingly muscular foreign policy and military expansion. The move to insert Mrs Xi's name and dogma into the party's constitution alongside the party's founders came at the close of a twice-a-decade congress that gathered the country's ruling elite alongside rank-and-file party members. It not only places him in the first rank with past leaders Mao Zedong and Deng Xiaoping, but also effectively makes any act of opposing him tantamount to an attack on the party itself. "The Chinese people and nation have a great and bright future ahead," Mr Xi told party delegates as the meeting came to a close after delegates approved the addition of his ideology of "socialism with Chinese characteristics for a new era" to the party charter. "At this great time, we feel more self-confident and proud. At the same time, we also deeply feel a heavy sense of responsibility," he said. The concept Mr Xi has touted is seen as marking a break from the stage of economic reform ushered in by Deng Xiaoping in the late 1970s and continued under his successors Jiang Zemin and Hu Jintao. The placement of Mr Xi's thought among the party's leading guidelines also comes five years into his term - earlier than his predecessors. "In every sense, the Xi Jinping era has begun in earnest," said Zhang Lifan, an independent political commentator in Beijing. "Only Mao's name was enshrined in the party ideology while he was still alive. We're opening something that hasn't been broached before." For centuries, Chinese emperors were accorded ritual names which signalled either that they were successors in a dynastic line or the founder of an entirely new dynasty. 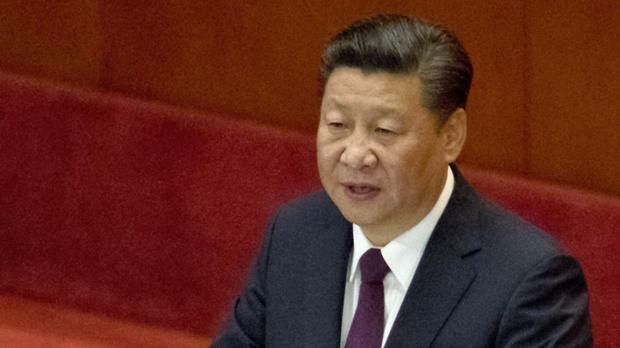 What Mr Xi accomplished this week was a modern equivalent of the latter, Mr Zhang said. "He wants to join that pantheon of leaders," he said. Despite being elevated to the status of both a political and theoretical authority in the party, Mr Xi still lacks the broad popular support of the Chinese public that Mao enjoyed, said Zhang Ming, a political analyst in Beijing who recently retired from a prestigious university. "This (elevation) is a result of the party's political system and not of the sincere support of the people's hearts," Zhang Ming said. "If he can achieve that, he would become Mao." Mr Xi has described his concept as central to setting China on the path to becoming a "great modern socialist country" by mid-century. This vision has at its core a ruling party that serves as the vanguard for everything from defending national security to providing moral guidance to ordinary Chinese. He has set the target dates of 2021 - the 100th anniversary of the party's founding - and the People's Republic's centenary in 2049 - for the establishment of a prosperous, modern society. China has the world's second-largest economy and legions of newly wealthy urban residents, but raising living standards for millions of people continues to be a challenge. Retired professor Zhang Ming said the goals Mr Xi laid out were lofty but mostly constituted mere rhetoric. "These goals have nothing to do with the people but are just jargon that people shouldn't take seriously," he said. "It is not important for him to achieve these goals, just as long as his power reaches its peak." The move came at the close of the 89 million-member party's twice-a-decade national congress at Beijing's Great Hall of the People, where nearly 2,300 delegates gathered to elect the party's leading bodies and hear reports. The constitution was also amended to include references to the party's "absolute" leadership over the armed forces, which have been modernising rapidly under Mr Xi, and a commitment to promote his signature foreign policy and infrastructure initiative known as "One Belt, One Road". That initiative seeks to link China to Southeast Asia, Central Asia, Africa, Europe and beyond with a sprawling network of roads, railways, ports and other economic projects.